What the heck is an ETF anyway? If you are new to the investing world (like I was a few years ago), you probably hear a lot of acronyms thrown around. A common one among these, that you will hear at all levels of investing, is ETF. An ETF refers to an Exchange Traded Fund and is a type of security that you can invest in to earn a return on your money. ETFs can be a great tool for newbie and seasoned investors alike as they provide the benefits of diversification with high transparency and lower costs than other investment options. In short, an ETF is a type of investment fund that is traded on stock exchanges just like a stock. These funds attempt to mirror the value of a set of commodities, stocks or bonds and can essentially be thought of as similar to purchasing those investments. A more technical term that is often used is a “pooled investment vehicle.” This basically means that there are a basket of underlying assets that you are buying a share of the value in. Most popular ETFs track some type of index, like a group of stocks, bonds, or commodities. The purpose of an ETF is to give individual (or institutional) investors the chance to diversify with a large number of assets that may be difficult to invest in otherwise. It allows us as normal investors to have institutional level portfolios with lower costs and higher transparency. The way that ETFs work is actually fairly simple. Think of it in this scenario: you and five friends want to invest in 500 stocks that you think will outperform the market over time. Instead of each of you trying to buy tiny amounts of shares of those stocks, you decide to pool your money together. This creates the “fund.” That fund would work with a large investor like a bank or investment company (referred to as authorized participants, or APs in the ETF world). The AP would build a portfolio of the underlying assets (stocks in this case) then give that to the fund in exchange for shares in your ETF. This process is referred to as creation. The other side of that process, redemption, would be your fund turning the stocks back into the AP and receiving your shares of the ETF back. The value of a share in the ETF would be correlated with the total value of the assets that the fund has a stake in. In this example, if those 500 stocks had a total value of $100 and you and each of your five friends owned one share, your share would be worth $20. If the stocks go up, your share is worth more. If the stocks go down, your share is worth less. In this regard, ETFs are very similar to mutual funds or index funds. What makes ETFs different from mutual funds? The biggest difference between ETFs and mutual funds lies in the “exchange traded” portion of the name. ETFs are traded on stock exchanges just like a common stock. This means that you can buy or sell at any time that trading hours are open. This differs from mutual funds, which only process once per day. You also have the ability to treat it like a normal stock, including doing things like placing limit orders, stop loss orders, buying on margin, etc. What type of ETFs can you trade? 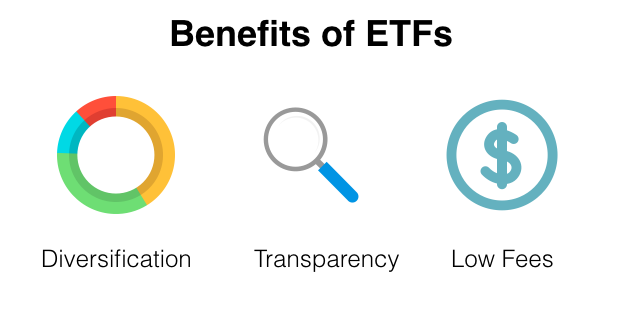 The main benefits of ETFs include tax efficiency and lower transaction costs. Because you are not buying and selling each individual stock, you don’t have to pay capital gains tax on each transaction like you would if you were purchasing outside an ETF. Because they are traded like stocks, you get the advantages of lower fees (reflected in an expense ratio) than most mutual funds, as well as the ability to purchase on margin, sell short and more. Another major advantage is the transparency that comes with an ETF. The funds that mirror an asset are priced frequently throughout the day and you know exactly what it is that you own a share of. Two types of ETF products that are slightly different than the standard ones mentioned earlier include inverse ETFs and leveraged ETFs. An inverse ETF uses a number of complex investment tactics to profit when the price of an ETF falls. For instance, if you owned a share of an inverse gold ETF, if the price of gold goes down by $1, your share gains $1. A leveraged ETF is tactically similar to an inverse ETF, but is meant to increase your risk/reward equation. If you own one share of a leveraged gold fund, if gold went up $1, you may make $2 or $3 depending on the type of ETF. Similarly, you could own an inverse leveraged fund where the same scenario would leave your share with a loss of $2 or $3 if gold increases by $1. ETFs, since they are traded on stock exchanges, can be purchased through any investment broker. If you have an existing account with a company like Fidelity or Charles Schwab, you can search for ETFs alongside any other stocks. Make sure that you understand your commission and fee structure, especially if you plan to buy small portions of ETF shares in multiple transactions over time. Now that you have an understanding of what an ETF is, I strongly recommend that you do your research before making any purchases. Just like any stock or other investment vehicle, it is important to understand what you are buying. If you don’t know much about the foreign currency market, then a foreign currency ETF may not be the most appealing option to you. I prefer going with broad market indexes such as SPDR or QQQ, but there are literally hundreds of ETF options out there. Overall, choosing strong, trustworthy funds with solid performance records and understanding what you are buying is a good start. One thing to keep in mind is that you may already be diversified in ETFs if you have your money with companies like Wealthfront or Acorns, so think about that before determining your diversification strategy. I love ETF’s! Especially in taxable accounts. Low ER, and it’s easy to do tax loss harvesting.